Both Lyle and I organise our rucksack kit into drybags, this has the benefit of obviously keeping everything dry and secure, but also keeps essential items together and makes them easier to find quickly… Well that’s what I thought!! I was recently involved in administering first aid to a fallen mountain biker and my rucksack was located at the nearby kit dump. I sent a fellow team member to get my first aid kit from my sack, to which I received a question which colour bag is it in? It was at this point that I realised that the colours of the bags mean something to me but no one else! I also thought that if I get hurt or become unconscious and a passer-by found me, it would not be obvious to them that I carried a first aid kit. On getting home I did a bit of research and came up with these bright red Exped first aid drybags, they come with a white cross and the words ‘First Aid’ emblazoned on the front, so they are easily seen in an emergency situation. They are made from 70 D Taffeta Nylon, PU coated, with taped seams, waterproof to a 10,000 mm water column. This means that you could put a square column of 1 inch by 1 inch on top of this bag and fill the column with water 10,000mm or 10m high (32.8 feet for Lyle!) before it would leak. The bags are big enough to take a Mountain Leader first aid kit, it takes mine easily and I have a few added extras in it, along with my spare compass (for some reason I have always kept my spare compass in my first aid kit), and there is enough room to stash some surgical gloves in the top to act as a reminder to put then on before you start first aid! The EXPED Fold first aid drybag is light weight, weighing in at a measly 36g and measuring approximately 38 x 23cm when laid flat with no contents and 30 x 16 x 12cm when optimally packed. The Exped First Aid bag also has a useful handle on its bottom, this is ideal for holding on to when pulling the contents on of the bag, especially when it’s a tight fit! 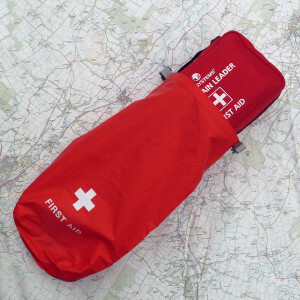 So to sum up these bags easily identify your first aid kit to anyone, they are ideal for your rucksack, a school camp or even the back of your car. They keep your kit dry and clean and the sealed roll-top closure can also be used as grab handle or as a hook loop (i.e. to hook onto a branch or harness). My one is in use already! !